It’s a shame that there’s a huge range of fantastic foods that are somewhat neglected due to the ease of cooking on a gas or electric stove. We believe that there’s a real satisfaction of going back to basics and cooking using an open flame. Whether that’s smoking a brisket, cooking a pizza in a wood fired oven or trying your hand at a range of campfire recipes. So we’ve put together a list of some of the best outdoor cooking books out there to give you all the information, best recipes and interesting tips and tricks to make the most out of outdoor cooking. 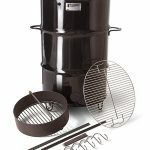 Building and customzing your own smoker. Finding and curing the right wood. Creating and tending perfect fires. Sourcing the best quality meat. Some interesting history and facts about Texas BBQ. 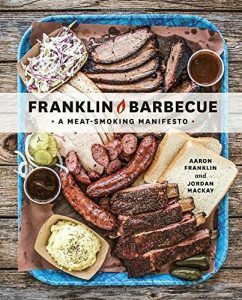 And of course, how to cook BBQ like Franklin Barbecue. This is one of the most refreshing and interesting books to come out in recent years and we all absolutely loved it. 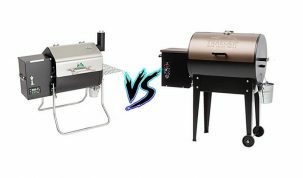 It isn’t a strict how to of defined steps, it gives you a detailed overview of what BBQ is and how you can use that knowledge to find out what works best for you. by The Editors of Southern Living and Chris Prieto. 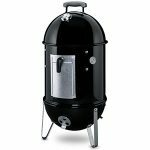 Stunning full color, step by step photos for mouth-watering recipes on all the usual BBQ meats and more. Expert advice from award winning pit masters. A rainy day BBQ chapter for cooking on the stove top or in the oven. Extras including slow cooker recipes. A range of smoked vegetable recipes to mix things up a bit. 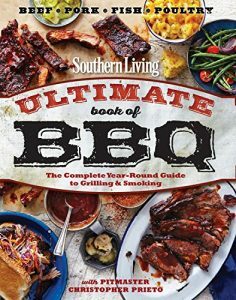 If you’re looking for a complete home cooking BBQ book with some of the best looking photographs and simplest recipes then this is the book for you. 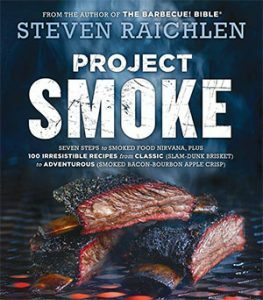 Steven Raichlen does it again with another fantastic book on BBQ. This time he focuses on smoking with Project Smoke. Every detail you could ever want to know about smoking is included in this book. 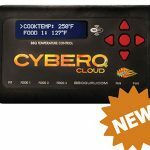 There’s a huge range of recipes, including recipes for smoking desserts and is perfect for the first time smoker or the seasoned veteran looking for something new. In depth description of various smokers. Essential brines, rubs, marinades, and barbecue sauces. A complete guide to fuel, including how each type of wood subtly seasons a dish. 100 enticing, succulent, boldly-flavored smoked dishes, including Bacon-Crab Poppers, Cherry-Glazed Baby Back Ribs, Slam-Dunk Brisket, Jamaican Jerk Chicken and even Smoked Chocolate Bread Pudding. 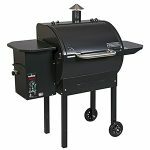 If you’re looking for a complete book on BBQ smokers and smoking in general then this is the one for you. Why dry brining is better than wet brining. Why rubs shouldn’t have salt in them. 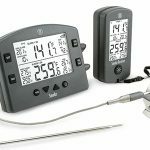 The importance of digital thermometers. Why searing doesn’t seal in juices. Bring meat to room temperature before cooking. Soak wood before using it. You should sear first, then cook. Last Meal Ribs; Simon & Garfunkel Chicken; Schmancy Smoked Salmon; The Ultimate Turkey; Texas Brisket; Perfect Pulled Pork; Sweet & Sour Pork with Mumbo Sauce; Whole Hog; Steakhouse Steaks; Diner Burgers; Prime Rib; Brazilian Short Ribs; Rack of Lamb Lollipops; Huli-Huli Chicken; Smoked Trout Florida Mullet -Style; Baja Fish Tacos; Grilled Lobster, and many more. 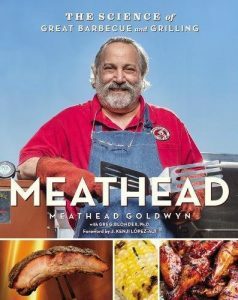 If you’re looking for a complete BBQ book that has a huge range of outdoor cooking information, lovingly wrapped up in fantastic color photos and a great sense of humor you can’t go wrong with this book. Big Bob Gibson’s Bar-B-Q in Decatur, Alabama is run by the great grandson-in-law of Big Bob Gibson himself and author of this book, Chris Lilly. 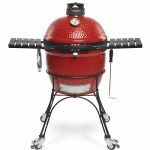 Being part of the winning team of the World Championship BBQ Cook-Off for six years in a row with hundreds of other ribbons to their name, Chris Lilly knows what he’s talking about when it comes to outdoor cooking and BBQ. 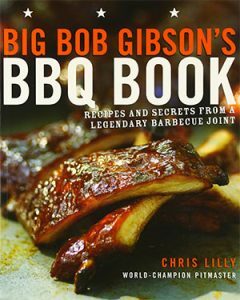 In Big Bob Gibson’s BBQ Book Chris Lilly cover’s everything you need to know to recreate fantastically tasty BBQ in the same Alabama style as what he’s famous for. The book also goes into the history of Big Bob Gibson BBQ, from the start of the restaurant to the award winning restaurant and competition winning team they are now. Complete run down on rubs and glazes. Award winning seasonings and combinations. How different woods produce different heats and which is used when. Pulled pork, smoked beef brisket, pit-fired poultry, and of course, ribs. Complete the BBQ with sides like red-skin potato salad and desserts, such as Big Mama’s Pound Cake. Hundreds of quality photos and easy to follow instructions. If you’re looking to take your BBQ game to the next level, then this is the book we recommend. There’s a lot of very in depth information that you can learn and use in your own way, and before you know it you’ll be cooking the perfect brisket or smoking a turkey for the first time. 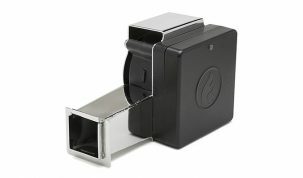 Electric smokers are all the rage now a days because of their ease of use and flexibility. 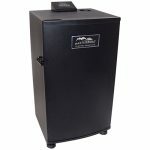 If you’re looking for one we covered the best electric smokers available today. 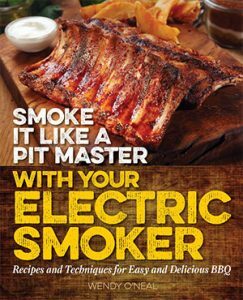 If you already have one then this book is the perfect companion to your electric smoker. 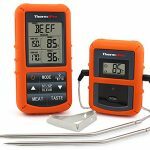 The importance of using thermometers. Sweet and Tangy Baby Back Ribs. And many more recipes with over 70 color photos and detailed guidelines. Wendy is an experienced cook and has had a lot of success with her blog Around My Family Table. If you’re looking for a good beginners guide to electric smokers then this is the perfect book for you. Lighting and maintaining the fire. What to do with lower temperatures. 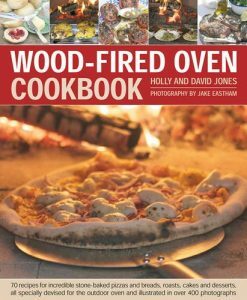 Inspiration and ideas for a huge variety of recipes able to be cooked on a wood fired oven. This is a great introduction for anyone looking to get into wood fired oven cooking. There are a lot of very easy recipes that give great results every time. The little extras, such as timing guides and help with lighting and maintaining the fire are just the cherry on a very tasty cake. Making pizza and other live-fire flatbreads. Grilling, steaming, braising, and frying. Baking pastry and other recipes beyond breads. Rendering animal fats and clarifying butter. Food dehydration and infusing oils. A myriad of other ways to use the oven’s residual heat. Appendices in oven design and temperature logs. This is probably the most complete book on wood-fired oven cooking and outdoor cooking available today. 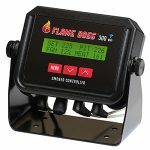 There are the usual recipes, tips and tricks and run down of equipment and pizza oven accessories, but it’s a lot more than that. It reminds the reader how wood-fired ovens and outdoor cooking can draw people together and bestow a sense of fellowship and comradery that is still so important today. We would recommend this for the recipes alone but the additional extras make it almost a no-brainer. It’s a little more expensive than the other books on the list but there is so much value in the book that we still buy it again if it were twice the price. 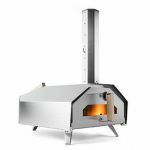 If you’re looking for your own wood-fired oven we’ve looked at the best wood-fired ovens available today. Straightforward instructions on all forms of campfire cooking, from cheese on a stick to home made naan bread and roasted rabbit. Mouthwatering photographs helping to detail the entire process from raw materials to delicious meal. Complete instructions on how to build your own bread ovens, roasting hearths and spits. Ingenious ways of cooking such as plank-roast fish with nothing more than fire, a piece of wood, and a hammer and nails. Also, brick oven pizzas, inverted steel wok flatbreads and campfire stews. Even if you never actually manage to make any of the recipes from this book reading it is enough to justify the relatively low price. This is probably the best value book on the list and we would recommend it to anyone with an interest in outdoor or campfire cooking. The books is as much of a travel log as it is cook book. 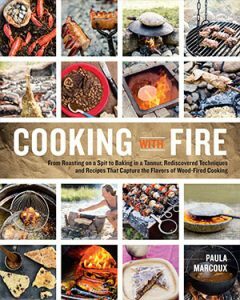 It’s a fascinating journey throughout the world and a compelling look at the simplicity of cooking with campfires and open flames. 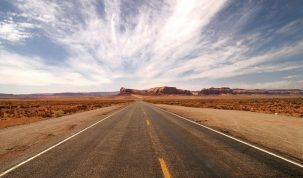 There is something interesting at every stop and a lesson to be learned about slowing down and enjoying the process, not just the result. 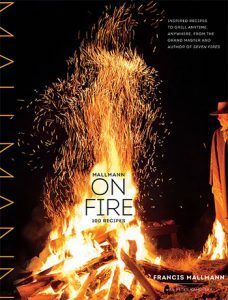 There is an episode of Chef’s Table on Netflix that is dedicated to Francis Mallmann and takes you through some of the adventures featured in this book. We highly recommend both. Well that’s our list of best outdoor cooking books but there are so many more fantastic books out there than just the ones we mentioned. 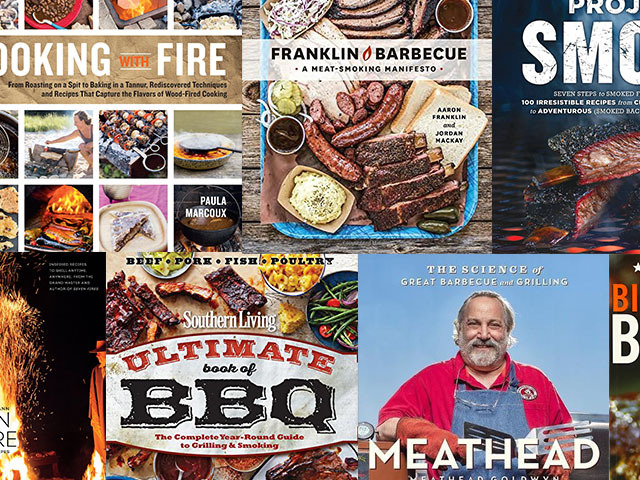 Some of the best BBQ books aren’t featured because of the sheer amount. A quick look on Amazon and you’ll find you’re spoilt for choice. 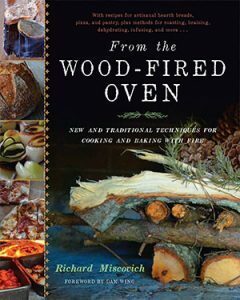 Likewise, there are several more books dedicated to wood fired ovens and outdoor cooking that cover so much more than just brick oven pizzas and campfire recipes. We hope you’ve found something interesting and if you have any recommendations then let us know in the comments.